Collateral design for a forward-thinking fitness center. 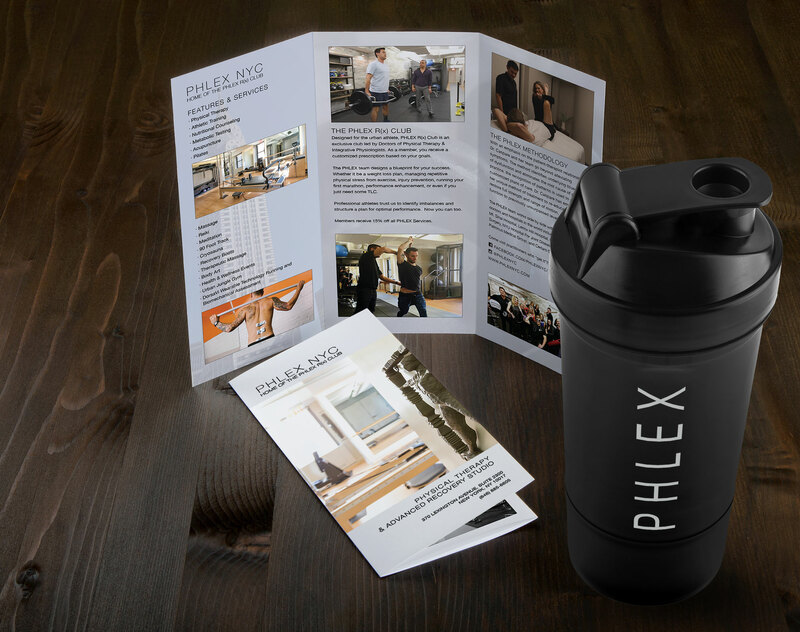 PHLEX NYC is New York City’s premier physical therapy and integrative care studio. Their holistic and patient-centric approach cultivates an atmosphere that breeds empowerment and nurtures the spirit. That’s wonderful, but they have a 5,000 square foot studio in Midtown Manhattan, and they needed to fill it. The owner was looking for a way to explain their services that allowed for them to get into details that wouldn’t fit into a casual conversation. Marketing collateral design is one of our strong suits and we suggested a brochure, and relevant piece of brand collateral, to promote their brand on their budget. We designed tri-fold brochures that are updated and printed every year, and produced sports bottles a folded brochure can be put in to create a memorable hand-out (and fit with the fitness center’s eco-conscious approach). Marketing collateral design is a balance of creativity, communication, and cost. Often the latter trumps the former, but communication is always paramount. We start with the brand messaging platform (or work with the client to create one) to ensure consistent content tone and voice, and on-brand copy. We then conceive of, design, and develop collateral pieces that will make a brand stand out. Producing marketing collateral is an art in and of itself, and we leave it to the professionals to actually create the items we work so hard to design. We have relationships with with the best printers and vendors in the business, who work with us to create beautiful solutions. Often clients’ only experience with print marketing collateral production is VistaPrint or similar, who offer a very limited selection tailored to a broad population. We have access to 1000’s of different options, and can help you design the perfect piece of marketing collateral for your brand.